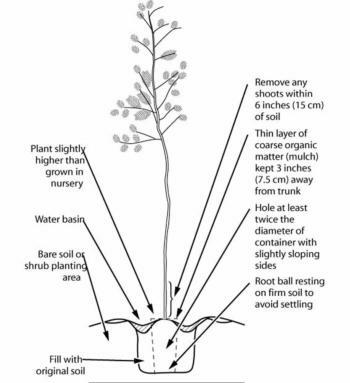 The planting hole should be 2-3 times as wide as the original container and only as deep. Amending the planting soil is not recommended for trees, as the roots quickly outgrow the planting hole. The top of the root ball should be slightly above soil level when finished back filling to allow for settling of the freshly dug soil. The tree crown below the soil level is a recipe for root rot as water collects next to the trunk after irrigation or rainfall. Trees should not be staked if they can stand without it, unless they are in a high wind area and likely to grow crooked before their trunks harden. Download a free guide here: Planting Landscape Trees.